Mac's staff service technician, Barney, asked a great question when he mentioned that Pittsburgh radio station KDKA made the country's first commercial broadcast in 1920: "Who was listening?" It is a reasonable question since prior to the beginning on commercial radio broadcasts there would have been no reason for there to have been a lot of people to own a radio for receiving commercial broadcasts. The answer, of course, is that there were plenty of multi-band radios in homes and businesses for listening in on shortwave broadcast from around the world - a very popular pastime in the era. Just as today we are bombarded with admonitions to not stare at computer monitors or cellphone screens for too long lest we suffer near-sightedness or worse, radio listeners of yore who used headsets were told, "Youths of this generation will never have as protruding ears as some of their older brothers." I suppose the most serious ramification would be a reduced ability to discern the direction of origin of sounds, front or rear. 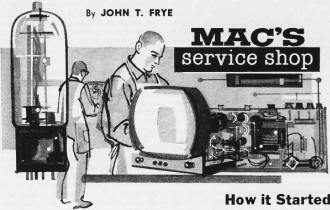 You can see many of the Radio Service Data Sheets (see the full list at the page bottom) I have posted for early radios from the sort of old electronics magazine Mac references. BTW, here is the "Antenella" device mentioned by Mac. It is akin to the line cord TV antennas that were sold in the 1950s and 1960s. "Hey, that's pretty old reading material, isn't it?," Barney remarked as he came into the service shop to find Mac, his employer, deeply intent on one of several age-yellowed, newspaper print magazines spread out on the service bench in front of him. "Right you are," Mac replied. "A fellow in Peru ran across these the other day, and last night he brought them over and gave them to me. There are nine copies of Radio Digest Illustrated, a weekly radio magazine, dating back to October, November, and December of 1923. They present a fascinating picture of this business we are in when it was just a pup with its eyes hardly open yet. Remember that KDKA had started the whole broadcasting business only three short years before when, on the night of November 2, 1920, it came on the air with the returns of the Harding-Cox presidential election. KDKA began transmitting on 833 kilocycles with a whole fifty watts of power." "Who was listening?" Barney wanted to know. "'Radio has divided itself into two distinct groups of broadcast listeners, those who buy a complete set and those who purchase the parts and put them together in a way that suits their fancy. The class who build their own sets are in a majority. When radio came, the man on the street found that he could make his own apparatus at a saving in cost and have a lot of fun doing it'." "What kind of sets were they using?" "Well, look at this advertisement for a Crosley Model X-J for only $65 - but remember those were big dollars, son. It is a one-stage t.r.f., detector, and two stages of audio affair. 'Local interference can be easily tuned out and far distant stations quickly and clearly heard,' it is claimed - although I'm not quite sure what 'quickly heard' means. According to the magazine the crystal set was still holding its own pretty well against the more expensive and complicated vacuum-tube receiver. Tubes advertised were the WD-11, WD-12, C-300 or UV-200, C-301 or UV-201, C-301A or UV-201A and the 'New UV-199.' What's more, you could have any of these tubes repaired and 'guaranteed to work like new' for charges varying from $2.75 to $3.50. Since a new tube cost from five to seven dollars, this was an enticing offer. "The majority of listeners still used earphones as this girl from the Vanities of 1923 is doing in the picture. Proof is contained in this story headlined 'Radio Ear' is New Pain for Listener. 'Tight headphones bring on the affection,' the story explains. 'A sharp, shooting sensation in the head is a symptom. Doctors suggest loosening up on headphones.' One assurance is given of benefit from radio headsets, however: 'Youths of this generation will never have as protruding ears as some of their older brothers'." "I'll bet those radiophans had lots of troubles," Barney hazarded. "Interference was a problem, too, as you can see from this Letter from a Reader: 'Regarding ... the subject of spark interference on or around 450 meters, I really hate to start in on this subject, for I get so exasperated every time I mention it. On long-distance work it is enough to drive one crazy to have nice concerts from Los Angeles, New York, Philadelphia, etc., all mussed up by that confounded dot-and-dash stuff. What do folks think of radio when you tune in a nice concert and then have one of those spark fellows slip in with his machine gun noise and gum up the works?' "
"Was he talking about hams?" "Not necessarily. An editorial in the same issue suggests: 'Some listeners-in keep complaining that amateurs interfere with broadcasting. They do not actually know who is interfering. Half the time it is probably ships which are sending or shore stations handling regular commercial work. What these "knocking" listeners-in should do is to learn to read code so that they can identify the senders'." "Guess my TVI trouble ain't so bad after all!" Barney said with a grin. "Of course the antenna was a constant field for experiment and a cause of annoyance," Mac continued. "Doesn't this advertisement for a gadget that obviously uses the light line for an antenna sound hauntingly familiar? 'Cold winter nights won't find you on the roof fixing the aerial, removing snow and sleet, exposing yourself to sickness, if you use Antenella.'" "I see fading really bugged the boys back there," Barney observed. "Here is one guy, chief radio operator and announcer of a broadcast station, who claims he has found the 'real cause' of fading. It's so simple. Fading is caused by power fluctuations in the power line supplying the transmitter!" "It would have been nice had it been that simple; but a story in another of those magazines comes lots closer. It says tests carried out through the joint efforts of the Bureau of Standards and the American Radio Relay League in 1920-1921 point to the fact that 'uneven air' and variations in the Heaviside layer are somehow tied in with fading radio signals. 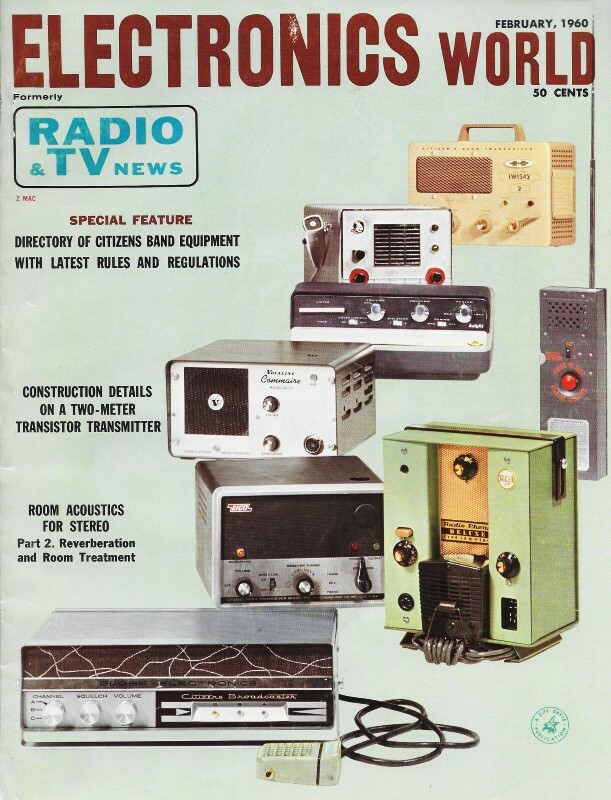 Incidentally, all anyone has to do to be convinced of the heavy debt modern radio, television, and electronics owes to the radio amateurs is to leaf through these magazines and see what an active, important part they were playing back there in the very beginning. Here they are holding a Wouff Hong initiation at a hamfest at Atlanta on December 27th, 1923. Here Fred Schnell, 1MO, traffic manager of the ARRL, is' hearing Leon Deloy, 8AB, for the first trans-Atlantic reception on the short-wave band of 100 meters. This story tells about relaying a message by hams from coast-to-coast in an hour and twenty-five minutes, and this one tells of the McMillan expedition at the North Pole being picked up by an amateur." "Wonder what those broadcasting stations were like?" "Well, here is a description of WBZ's new 1000-watt transmitter described as one of the finest in the country. It uses 'four 250-watt oscillator and five 250-watt modulator tubes. A modulation meter and control rheostat has also been added so that the operator can listen to the programs and gauge their modulation'." "I'll bet there were some far-out applications of radio back there." "You're right. Here is a picture of a German schutzman, or police officer, carrying a portable radio for receiving orders from headquarters. The radio is about eighteen inches square with four exposed tubes sticking out the top. The poor devil is wearing earphones under his steel helmet, and a loop antenna at least four feet square is strapped to his back. The accompanying text says disorders in Germany are frequent and that the officer carries this cumbersome equipment so that he may know when his presence is needed. He's going to be in great shape to quell a riot when he arrives on the scene in that rig. Another story says that in New York City an undertaker operates a hearse equipped with a radio amplifier and loudspeaker. As the vehicle enters the cemetery, chimes, hymns, and funeral music are played. Finally, look at this headlined story about a radio device just invented by a Canadian physician that will diagnose human ills." "Here's one for the book!" Barney exclaimed: "'Wired Service Corporation, located on Staten Island, is carrying to 500 residents of the island a six-hour program daily, to be increased when the service is extended to New Jersey. Upon payment of a certain sum, your set is installed and the programs come in.' Pay-Wired-Wireless away back there!" "You'll find lots of familiar names in those old magazines. Herbert Hoover, Secretary of the Commerce Department that licenses radio stations, says broadcasting needs an overseer. It was to get one in the form of the F.C.C., of course. Here is a picture of a younger, heavier, hairier Arthur Murray giving an over-the-air dancing lesson. Charles Chaplin tells a reporter how frightened he was at his first radio broadcast. This strikingly handsome man is the visiting Prince of Wales who is described as an ardent radiophan. Coolidge's address to Congress is believed to have been heard by a million and a half people. And Steinmetz dies on the morning of October 26, 1923." "What do the magazines say about us service technicians?" "Not much, as such. Most of the listeners, having built their own sets, also repaired them. The magazine gives instructions on how to build sets and also a lot of helpful hints, such as how to connect earphone jacks in series so that more than one person can hear, how to sandpaper tube prongs to insure better contacts, and how to employ earphones as a meter multiplier resistance so that the low-scale 'A'-battery meter can also be used to test the 'B'-batteries. I'll bet that was good on the earphones! "And then there is this story headlined: 'Hook-ups Galore. There are circuits everywhere. There are so many that a good radio electrician may wander into a store to buy a switch knob and actually hasten away in blushing ignorance'." Mac looked across at the metal file cabinets that contained around 2000 radio and TV diagrams and mused aloud, "I wonder what that radio electrician would think today. "But they were trying hard to guess the future," he continued. "Some of the guesses were good, some not. Here the manager of WGR is saying seeing by radio is not far distant. And there is something sadly familiar about this editorial that declares: 'Radio-controlled mechanical devices, electrically operated, will exercise an influence difficult to foretell. Ten years and a new war will develop radio and make its uses so far-reaching ... that another world war will be impossible.' But listen to this: 'The near future will see small, compact, and portable radio receivers ... in every home. There will be no outside antenna, no complicated wiring, and no batteries in the ideal foolproof set soon to be sought by up-to-date householders who will demand radio service just as they do telephone service today.' Some of the wise ones knew they were going to need us." "This is more fun than looking through a family album," Barney declared as he leafed through the magazines. "I think it's more than amusing," Mac said soberly. "Examining the past is the best way to understand the present and guess the future. That's why we study history. Personally, when I look back at this crude beginning of the electronic industry and realize how far and how fast it has come in thirty-seven years, I feel a little awed but very, very proud of being a part of it."